You will love this square aluminium design with its smooth lines and chunky, confident feel. This would stand out at home or in the workplace. One of the Aeon Aluminium range. Aeon Smyrna radiator- lowest UK price with free delivery, (* See terms ) Aeon accredited retailer. 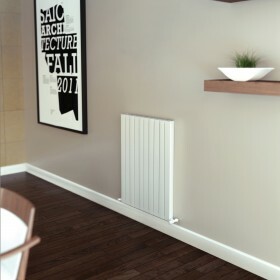 Aeon designer radiators. Prefer the strong, silent type? Then you will love this square aluminium design with its smooth line..